These days, Dharamsala feels alternately like a temple and the seat of revolution. At times it feels like both. 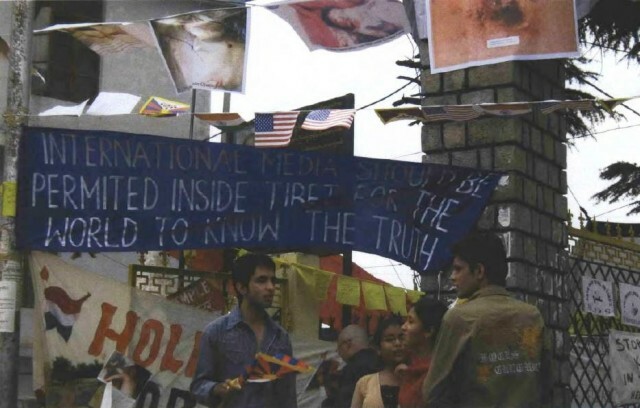 Every morning, thousands of Tibetans, young and old, those born in Tibet and those born in exile, march down the hill from the market of McLeod Ganj, shouting in English for justice and human rights, for the help of the UN, for the long life of the Dalai Lama. Today, their shouts are mingled with the moan of long horns blasting out from a nearby monastery. The evening marchers end up at the tsuglakhang, the temple located right in front of the Dalai Lama’s private residence, to assemble in what is essentially the Dalai Lama’s front yard. They shout freedom slogans and “Bod Gyalo!! !” (Victory to Tibet) at the top of their lungs for twenty minutes, while young boisterous monks wave giant Tibetan flags to rally the crowd. The red, yellow and blue of Tibetan flags are everywhere, and a feeling that must accompany all revolutions of past times – a feeling of passion, resolve, and the sting of injustice – stirs the air. Living in morality is one fundamental spiritual practice that is a very important source of happiness for you and for all living beings. This is also one of the best contributions that you can give to this world, for world peace.